Large bull moose swims in Maine’s Rangeley Lakes Region. You’ve found your perfect Maine cabin overlooking a quiet pond. As you enjoy your morning coffee you look out over the lake and see what appears to be an oversized deer belly-deep in the water near the opposite shoreline. The submerged head appears, thick antlers spread wide, water plants dripping from its munching mouth. The animal looks right at you. Finding you neither interesting nor edible, the moose plunges its head back in the water for another bite. You have been suitably ignored by a moose, the state animal of Maine. What Exactly is a Moose? The moose, or scientifically speaking, Alces alces, is the largest member of the deer family. Maine has roughly 29,000 of these large herbivores, second only to Alaska in moose populations within the United States. Because of their size, moose are easier to spot than the smaller deer species. One moose can weigh as much as 1,000 pounds, with an antler spread of five feet. The animal favors more open spaces, particularly around water where they go “snorkeling” for water plants. The moose appears docile, and most times they are as long as you don’t approach. But, these animals are unpredictable and may charge if feeling threatened. A female moose, called a cow, will fight to protect her young. During the fall mating season, called the rut, the males, or bulls, are particularly testy. No matter what time of year, it’s best to give moose their space. Moose are found throughout Maine, but the largest populations are in the more remote wilderness areas. Some of the best moose watching locales include Aroostook County, bordering Canada, and the Maine Highlands, particularly around Moosehead Lake. 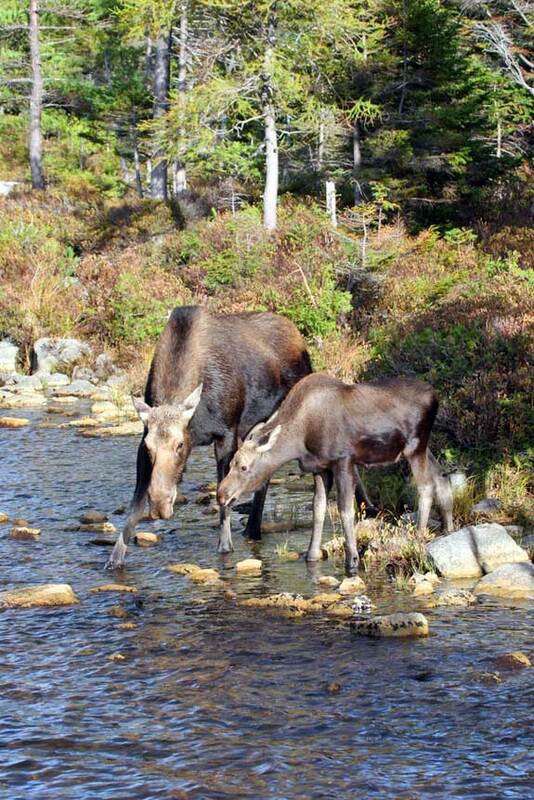 The Kennebec and Moose River Valleys as well as the Western Mountain and Lakes region are also prime moose habitat. 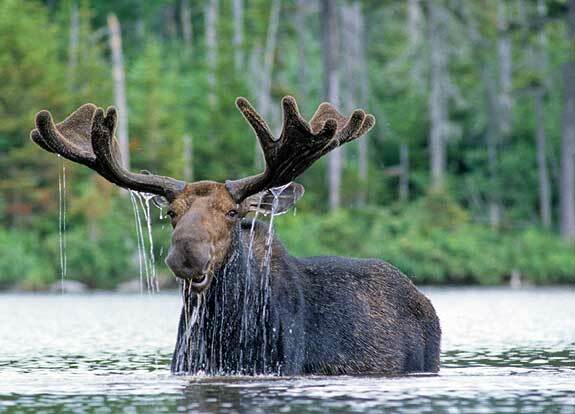 Moose spend most of their days eating, either around and in lakes or ponds or near forest meadows. They avoid the heat of the day and are most active early in the morning and near dusk. Moose have poor eyesight, so you will most likely see them before they see you. Their hearing and sense of smell are excellent. Moose sometimes burst onto roadways from forested areas. If you are driving in moose territory be extra careful. The best time of year for moose watching is late-spring until the middle of summer, and again in early fall. Except for mothers with calves, moose tend to be solitary creatures. One exception is the rutting season in September and October. Males tend to get in each other’s way and anything can happen. One of the safest ways to look for moose is to hire a moose watching guide, especially if you have little or no experience navigating the great outdoors. Registered Maine Guides are professionals that have passed a battery of tests to gain certification. 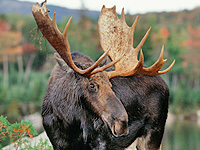 Some guides, such as Northwoods Outfitters in Greenville Maine, offer moose safaris, sometimes by canoe or float plane. Others offer winter moose watching, complete with the thrill of traveling by dog sled. Both private and group tours are offered. Another option is to stay at one of Maine’s sporting camps that have resident guides. Click here to see a list of guides offering moose watching tours. One place to find moose and other species of Maine’s wildlife in a semi-captive environment is at the Maine Wildlife Park (maine.gov) in Gray, Maine. This small town is located off of Interstate 95 about 20 miles northwest of Portland. Open from mid-April until mid-November, weather permitting, the park started as a rescue center for injured and abandoned animals. It expanded to include an educational center, allowing visitors to learn about and see many of Maine’s wild animals including moose. This kid-friendly park offers picnic areas, a Snack Shack offering drinks and treats and a number of exhibits that focus on preserving Maine’s living treasures. Cow Moose with calf feeding in a pond at Baxter State Park.